As magical as horses are, there’s always been room in our hearts for Pegasus, the winged horse of Greek mythology. The holiday season is also particularly magical, so those of you who have a person on your gift list who appreciates both the world of fantasy and fine jewelry may want to pay especial attention to this bracelet. Pegasus was more than just a horse with wings. Through the convoluted breeding program on Mount Olympus (if you think stud books are confusing, just spend a while reading Greek mythology!) Pegasus was sired by Poseidon (as his horse-god self) on Medusa, who you may remember as the freaky-looking woman with snakes on her head instead of hair. This means that Pegasus was divine twice over, truly suited to help the hero Bellerophon in his quest to kill the Chimera. While Pegasus may have been all that, Bellerophon was not, and fell off his mount while they were in the air. Today, Pegasus is seen as a symbol of inspiration, particularly for creative endeavors. People also view the winged horse as emblematic as one’s personal search for enlightenment and connection with the divine. 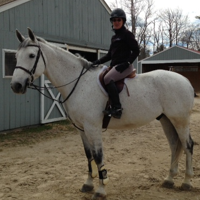 We’ve recently added two great Pegasus pieces to the collection. The bracelet pictured is distinctive and bold, with a chunky sterling silver chain. On one side of the ancient style charm, we see Pegasus, and on the flip side, Athena — goddess of wisdom — in her helmet. It’s a perfect piece for the woman who not only believes in dreams, but is willing to fight for them! Also available are a pair of sterling silver Pegasus cufflinks. Featuring the same ancient styling as the bracelet charm, these cuff links can add a distinctive, personal touch appropriate for any setting. They can be worn by men or women. 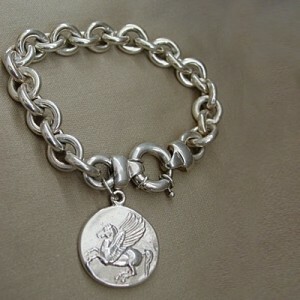 I am interested in the Pegasus silver bracelet. Is it available?